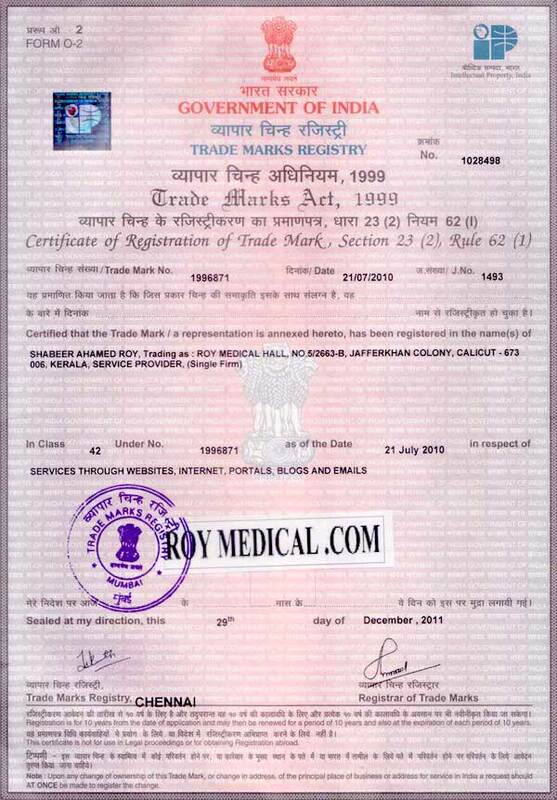 Roymedical.com now registered under TRADEMARK ACT 1999, in Class 42 to give service through WEBSITE, INTERNET, PORTALS, BLOGS AND EMAILS. Dr Roy Medical Hall is the first online consultation service provider in Kerala-India for Sexual Problems with Unani Herbal medicine. Roy Medical Hall is foremost Authentic Unani Medical Centre in India. Our specialities are scientific therapy, Counselling and non-surgical solution for all kinds of male-female Sexual Problems with a Unani system of medication.